Click on the image for a hi-res PDF of this flu diagram. Seasonal allergies, the common cold, and the flu all tend to start during the fall and continue through winter. In addition, all three of these common ailments share similar symptoms. As a result, people often attempt to self-diagnose themselves or their children. However, the symptoms for each can be easily confused for one another. Symptoms of seasonal allergies, the common cold, or the flu can vary in intensity depending on the severity of the allergic reaction or viral infection. This makes it both more difficult and more important to accurately diagnose whether illness is a result of allergies, a cold or the flu. The symptoms of the flu are generally more severe than that of the common cold or allergies. Some symptoms are more likely to occur than others, even though many overlap. For example, a sore throat often indicates the onset of the common cold. With allergies or the flu, a sore throat is often a secondary symptom, usually resulting from a persistent dry or itching cough. 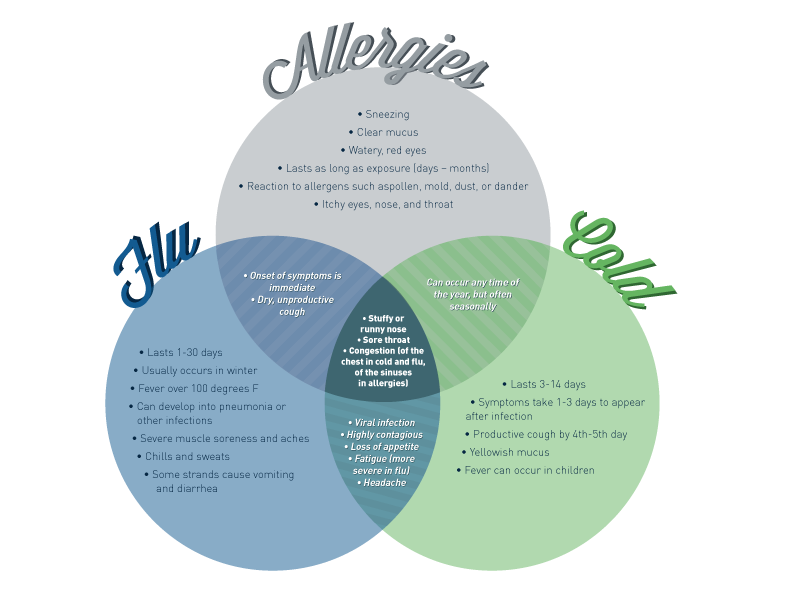 Below is a diagram of allergy symptoms, cold symptoms and flu symptoms that demonstrates differences and overlaps. It is intended to help identify common symptoms and is not a substitute for medical advice. It may be necessary to see a doctor if symptoms are severe, regardless of which of the three ailments are to blame. The risk of flu-related complications is the highest among pregnant women, children and the elderly. For more information about flu shots, cold and flu medication, or allergy medication, please contact your local Care Pharmacy.